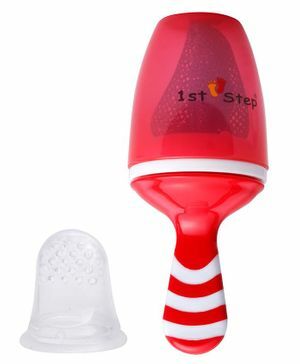 This 2 in 1 Pop fruit feeder from 1st Step is an ideal product that helps your baby enjoy a range of delicious fruits with minimised risk of choking. It comes with both silicone sack and mesh, which helps child enjoy it in both ways. Warning: Adult supervision is must. The feeder is to be used for feeding purposes only and not as a toy. Always check that the screw cap and mesh is tightly secures to the handle unit. Not suitable to be used in a conventional over or microwave.